This PowerPoint is a great way to support differentiated vocab revision for GCSE Spanish – with no photocopying! 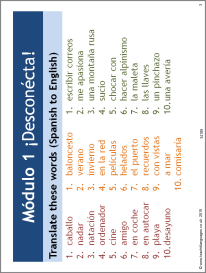 Designed to cover key vocabulary from the eight modules of the ¡Viva! AQA GCSE Spanish textbook, it could be used with any class for topic revision. Try covering one topic per lesson, either Spanish to English or English to Spanish – or both!. Revisit the vocab the following lesson to see some progress. Instructions are on slides 1-2. Excellent resource, well differentiated for higher and foundation groups to revise vocabulary & translation per topic.